Facebook CEO Mark Zuckerberg just held his first Live Video Q&A on Facebook to answer questions like whether or not he is a lizard (no) and what he think the future of Facebook sharing is (telepathy). But the best part of the hour-long session came when comedian Jerry Seinfeld popped onto the scene. Seinfeld coaxed some funny anecdotes out of Zuckerberg, like how his baby, Max, makes pterodactyl sounds when she wakes up, and how he’s programmed his door to announce the person who shows up in front of it. The first thing he does in the morning is — surprise! — check Facebook. Also, he recently broke his arm after falling off a bike! Zuckerberg isn’t wearing a cast because apparently when you’re trying to heal an elbow having mobility helps it get better faster than if you’re wearing a sling or a cast. 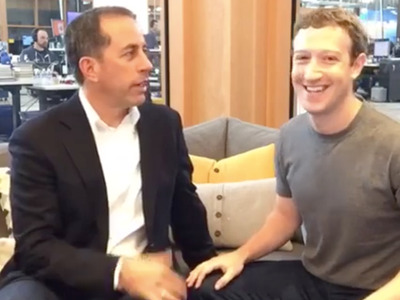 Zuckerberg’s arm really did look completely normal and he said that sometimes he has to remind himself not to lift things. The amusing clip comes as part of Facebook’s huge push to get more Live Video on its platform. In recent months, the company has been paying media companies like BuzzFeed and Business Insider to produce more high-quality Live video content and Zuckerberg promised more Q&A’s and surprise guests in the future.